Vision correction with latest generation of lasers is unquestionable and safe. 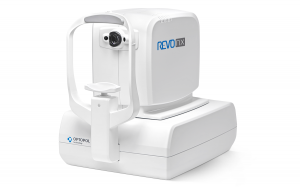 The WaveLight Allegretto Wave Eye-Q Laser was designed based on an idea that was once only imagined: a system with shortened surgery times, innovative and reliable eye-tracking, and a clear ergonomic concept. LASIK (Laser in Situ Keratomileus) is a chosen method in many centers of the refractive surgery that treats refractive irregularities through excimer laser, as: nearsightedness, farsightedness and astigmatism. Excimer laser creates cold beam which does not damage the surface tissue, while in contact with cornea, high energy photons disrupt molecular bonds in few levels. 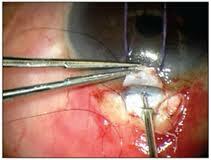 Thus small quantity of cornea tissue is removed and cornea curvature is eliminated. 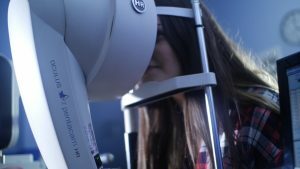 LASIK method eliminates the diopter by removing a fine layer of cornea using laser waves which formerly remove a surface membrane-flap with microkeratom. By placing the formed membrane in the normal position, it bonds after a few minutes excluding the use of stiches and bandages. Such combination of laser and microkeratom enables quick and convenient rehabilitation. 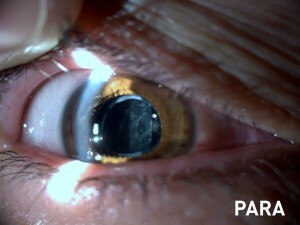 After the cataract surgery some patients may experience formation of a layer known as secondary cataract. Nd-YAG LASER Treatment appears to be a safe and efficient method of treating secondary cataract where patient does not have to go through surgical treatment for improvement of visual acuity. Diabetes is a chronic illness which attacks all the organs of human body. Thus, eye as a sensitive organ can be attacked by diabetes. Diabetic changes of eye can be slight to the most complicated which not rarely lead to blindness. Early and proper treatment of diabetes can prevent complication that can occur in the eye. Those who suffer from diabetes have to undertake ophthalmologic check at least once in six months. This check includes clinic examination-indirect bio microscopy as well as other examinations such as fluorescein angiography and OCT if necessary. Following this examinations further treatment is decided. 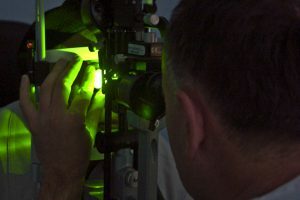 Further treatments include applying of laser in retina-laser photocoagulation of retina which is an elective method in diabetic retinopathy, application of medicaments inside the eye as Avastan or Lucentis to the surgical interventions – vitrectomy in severe cases where conservative treatment is not of help. Small incision Phako – method is one of the most contemporary approaches to be used today. The surgery is performed painless, with a topical anesthesia indicating application of local anesthetic in the form of drops. Immediately after surgery patient is sent for home care. Development of artificial lenses technology apart from cataract surgery enabled correction of former refractive anomalies such as: hypermetropia, myopia and astigmatism. PREMIUM lens (Trifocal, Trifocal Toric, Multifocal, Multifocal Toric) are the ideal for many cataract patients. Implantation of these lenses gives patients the best possible clarity at all distances. 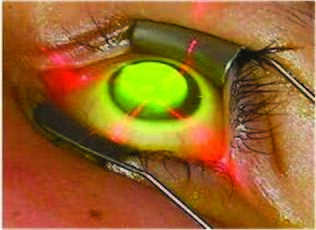 In certain number of patients where laser vision correction is not possible, alternative artificial lens implantation method can be performed. FDA approved ArtiLens PIOLs (Artisan, Artisan toric, Artiflex and Artiflex toric ) lenses are options available to improve the quality of your vision . ArtiLens PIOLs are iris fixated phakic intra ocular lenses. These lenses are meant for the correction of refractive errors, providing patients with high quality vision and reducing or avoiding the need for glasses or contact lenses. The ArtiLenses are proven to be one of the world’s safest, most effective IOL designs, with the broadest applications of any IOL – phakic, secondary/aphakic and trauma. 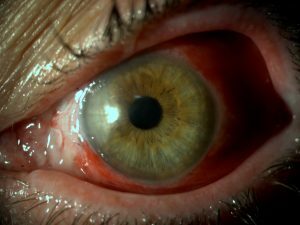 History of its development is quite long but it reached its culmination in 1974 when Conor O’Malley for the first time suggested vitreoretinal surgery with three-ports or “20 gauge” surgery. Many retina diseases which were impossible to be treated and often led to blindness can be treated successfully. Nowadays, except the vitreoretinal surgery 20 gauge, 23 and 25 gauge method is applied as well, which is differently known as surgery without stiches or “suturless”. Vitrectomi is a very sophisticated surgical method which requires qualified staff and advanced technology for its realization. Posterior segment surgery is named vitreoretinal surgery. 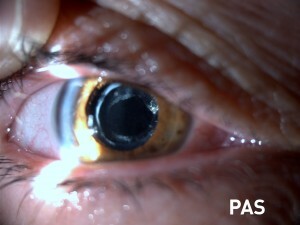 Congenital cataract is a unique entity of blurred lens from birth. It can occur in one side, occasionally both eyes. Reasons of its appearance can be of different nature though genetic effect as well as viral infections in first trimester of the pregnancy have special role. Often, presence of cataract in a newborn is followed with different anomalies not only in the organ of vision but other systems of the organism within the frames of different syndromes. 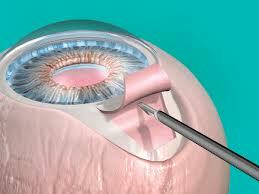 Congenital cataract treatment is surgical and it should be performed as soon as possible. Regarding the intraocular lens implant opinions are divided. 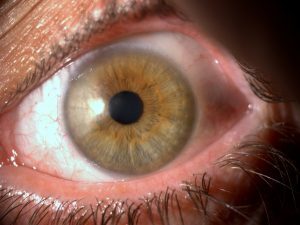 Some think that the implantation should take place at later stages when the eye stops growing, but others prefer the implantation during the first surgery. Nevertheless, post-surgical treatment must be under the strict supervision of ophthalmologist in order to undertake all measures for amblyopia prevention since solely the cataract surgery of the newborn is not the solution. It is a condition appearing in the early newborn period characterized with increased tearing and secretion. It a result of a blocked tear duct, a process usually occurring in the newborn infants. The treatment starts with application of antibiotics and instruction of the parents on the massage in the region of lacrimal sac. In the point when duct is not unblocked invasive procedures are applied such as: probing, silicone tube intubation to thedacryocystorhinoscomy, a quite complicated surgical procedure which is undertaken whenprevious procedures did not give expected results. All these methods are applied in our clinic. Strabismus is deviation of the eye (optic axis) of one or both eyes. Deviation may be within – towards the nose and called convergent Strabismus i.e. with new terminology Esotropia, or outside that is called divergent Strabismus or Exotropia. Optic axis deviation may be upward – Hypertyropia and lower Hypotropia, or can be found different combinations, horizontal Strabismus with vertical components, rotational etc. Normal development of the eye and optic tract (ways of seeing) develop also the binocular vision (vision with two eyes). Binocular vision must be coordinated so that the images of two eyes come together in one and in this manner we have a three-dimensional image (stereovision). If the sharpness of vision is not good and visual axes are not parallel it is not possible to develop stereoscopic vision. Paralytic Strabismus: is the type of strabismus where we have paresis or paralysis of any of the extrinsic muscle of the eye. Concomitant Strabismus: deviation of the optical axis, as a result of dysfunction of extrinsic eye muscle. Strabismus treatment – It is important to start as early as possible, i.e. as soon as noted oculomotor disorders, which gives success and better results. In the majority of deviations anomalies of refraction are present. Therefore the first step in the treatment of each strabismus is adequate correction of refraction anomaly. Possible sensory disorders are treated in specialized orthoptic/plenoptic labs by specialized personnel. The reason for Plenoptic exercises is to treat existing amblyopia, while orthoptic exercises are done to treat binocular vision disorders. At the end, when it is necessary (most) surgery treatment is performed. If treatment of existing deviations begins on time and correctly in most cases success is evident, in terms of amblyopia treatment and sensory disorders as well as in esthetic terms (straightening of deviated bulbus). It is a disease characterized by raise of intraocular pressure, changes in optic nerve and defects in visual field. It can occur in every age even newborn infants. It can be acute and chronic. Acute cases manifestation is with unilateral headaches, eye redness and occasionally accompanied by vomiting. Chronic cases of the disease have slow progress without characteristic signs while damaging the eye in irreversible way. In many cases it occurs after the age of 40. The most common complain of these patients is frequent change of near-sighted glasses. Children with born glaucoma are noticed to have bigger eyes than other children of the same age. Treatment of this disease can be medicated as well as surgical. Principally, cases uncontrolled with medicines are preferred to have surgical interventions. Most frequent methods of surgical treatment are: Trabeculotomia applied in born glaucoma as well as fistulizing methods (I-shanti, trabeculectomy) applied in adults. If this disease is not treated on time consequences are unrecoverable for vision. If you notice that child has big eyes and you need frequent change of near-sighted glasses, you should visit an ophthalmologist for a detailed check-up. A disease that affects adult ages, particularly women. It is characterized by tearing and eye secretion. Treatment of this disease is surgical and implies creation of a new canal with intubation of silicone tubes which serve for tear drainage in the nasal cavity. In our center, laser assisted DCR is applied. 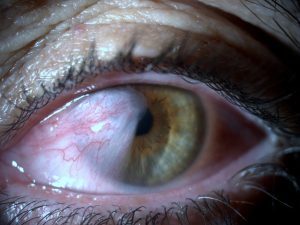 Pterygium is a pinkish, triangular tissue growth (butterfly wing) on the cornea of the eye. It starts on the conjunctiva near the nose. It may slowly grow but rarely grows so large to cover the pupil. CXL (Corneal Collagen Cross-Linking) is a new method of treatment of Keratoconus and the only method to stop the progression. 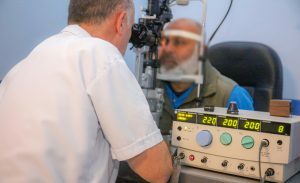 The goal of therapy is to strengthen the interconnection of corneal collagen fibers, thus stabilizes the cornea, stop thinning, ballooning (ectasia) and stop the progression of keratoconus’s. The method combines ultraviolet rays and vitamin B2 (riboflavin). This method can be realized with or without corneal epithelium craping, afterwards riboflavin in form of drops in every 2 minutes interval during 15 minutes until it passes in anterior chamber (camera anterior) and then UVX-ray is applied. 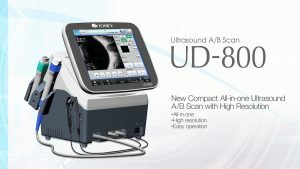 90% of these UVX-rays will be absorbed in the cornea and there isn’t any risk for lens or retina. 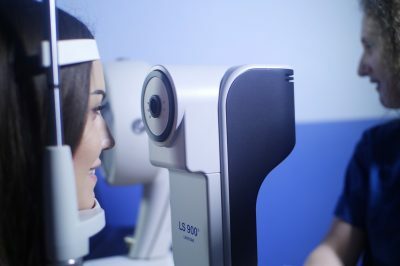 In our clinic, eye examinations are performed through exceptional, state-of-the-art microscopes equipped with a camera that takes pictures of entire front segment of the eye. All of the pictures are saved in the data base which enables high professionalism in following the different diseases in the front segment of the eye. It is a superior device (four in one) that features four main functions. 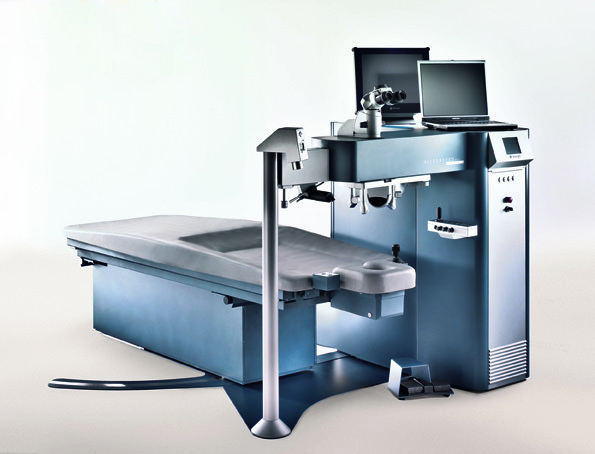 : dioptric measurement, keratometry measurement,pachymetry and measuring eye pressure with air. 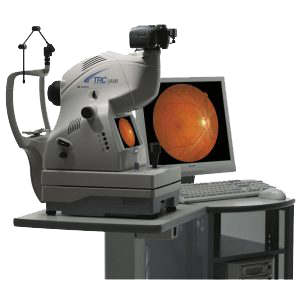 In our daily work we encounter a lot of patient complaints for inadequate dioptric setting! 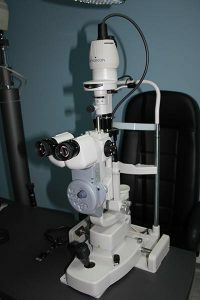 This device is very reliable and it distinguishes us from others in adequate dioptric setting. 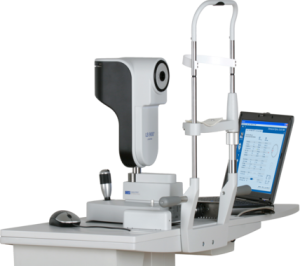 Our clinic has established a protocol where each patient prior to examination by the ophthalmologist is submitted to a dioptric and eye pressure measurement with this device. 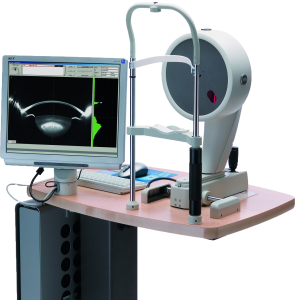 Pentacam HR – is the most recent technology that is used for analyzing the anterior segment of the eye. Detailed analysis of the eye structure enables us individual access towards each patient for dioptric elimination via laser. 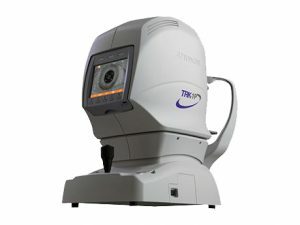 By means of this device that we own we are achieving superior results in dioptric elimination, but at the same time it enables us individual access towards each patient for measuring corneal relief, then analyzes/results obtained by this device are transferred to laser software and by using Topo-guided method we will do exact dioptric elimination of each eye while gaining superior results. 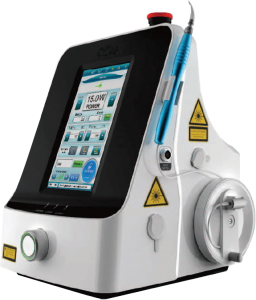 By means of this device we are 100% sure in prediction of laser treatment. 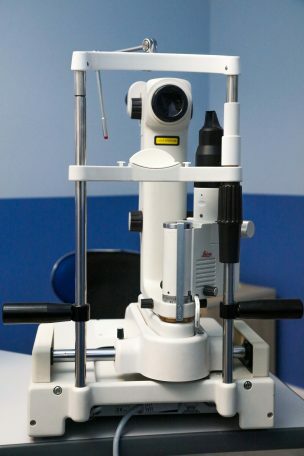 With application of PREMIUM lenses a need was presented for installment of this superior device for measuring axial length, keratometry where then intraocular lens is determined. Measurement is very simple and easy for the patient as well as for the personnel. This is a device of the latest generation was installed in our clinic 6 months after its launch in the world market. We are proud and feel safe by having this device in our possession. 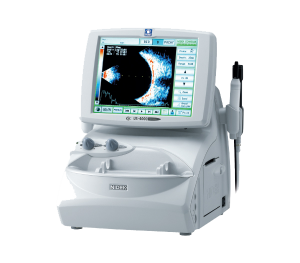 In cases where cataract is developed and inner side (fundus) of the eye cannot be examined, this device is used, where by means of echography fundus of the eye will be examined and we can determine possible damages inside the eye. In our center two devices which contain three probes are installed. 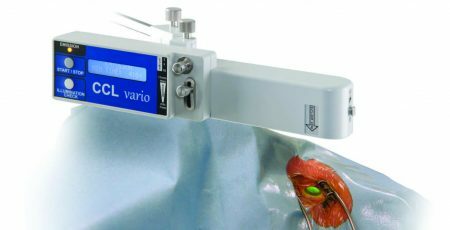 First probe (A scan) serves to measure axial length – for the determination of intraocular lens. Another probe (B scan) serves to examine fundus of the eye. And third probe serves for pachymetry measurements (corneal thickness). Fluorescein Angiography-FAG is a method of screening with contrast whereby reflects and discovers the changes that occur in the retina due to various diseases. Contrast called fluorescein is given in the vein and after a few seconds it reaches the blood vessels in retina. Afterwards photos will be taken with machine called fundus camera. Fluorescein Angiography is used for the diagnosis of many diseases such as: diabetic retinopathies, senile degeneration of the macula, occlusion of arteries or of the veins in the retina, inflammatory processes in retina and other. 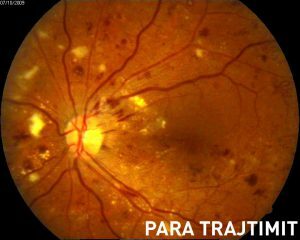 OCT or optical coherence tomography is a method of screening for yellow spot diseases or macula and optic nerve diseases. OCT does the scanning of retinal layers which highlights the changes that occur as a result of different diseases. 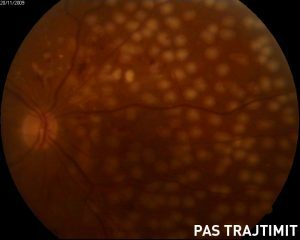 Nowadays without OCT we cannot imagine diagnostics and correct treatment of retinal diseases in general and especially of yellow spot diseases or macula in particular. 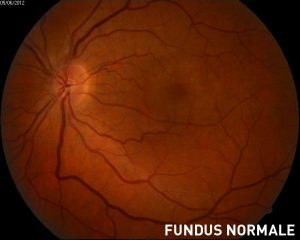 OCT is used for these diseases: senile degeneration of the macula, diabetic retinopathies, fibro vascular membrane of different nature, etc. Perimetry is a non-invasive method of examination which detects changes in the visual field for different reasons, particularly due to the damage of the optic nerve in patients who suffer from glaucoma. 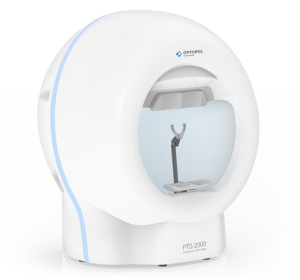 In our clinic, we have installed perimeter Optopol PTS 2000 which is very reliable and precisely detects changes in the visual field. We are committed to serve You 365 days a Year!